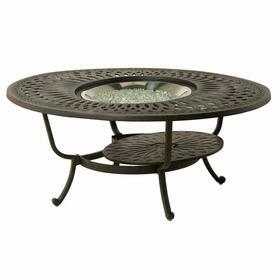 A hot trend in the outdoor living industry, fire pit tables offer an exceptional combination of patio furniture style and gas fire pit function. Homeowners love these fun items due to their incredible performance, simple maintenance and easy cleaning. They also provide a warm flame while producing no soot or airborne particles. Imagine avoiding messy lighter fluid, matches and heavy logs next time you require a fire out on your patio. This is possible with all of our brands, which starts with an easy turn of a knob or push of a button! 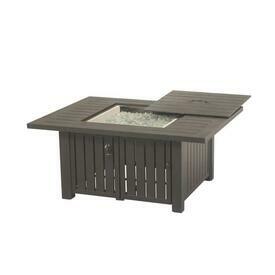 Now take these advantages of a gas fire pit and pack them into a stylish patio furniture chat table. They copy the look of traditional patio furniture chat tables, typically offering a low profile counter top that is surrounded by deep seating club chairs. In the cold seasons guests will gather to the inviting nature of the glow, but will be inclined to stay as they relax and take in the warmth of the flame. Yet when the seasons change, and a fire is no longer required, these tables transform into complete chat tables, with covers placed over the fire pit burners for a smooth, seamless look. 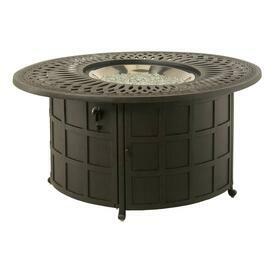 If you are looking for an innovative outdoor idea, consider a new Fire Pit Table from Family Leisure!